Happy Independence Day! I hope you are all enjoying the day, celebrating our country and hopefully avoiding Hurricane Arthur! Do you have your red, white and blue out? 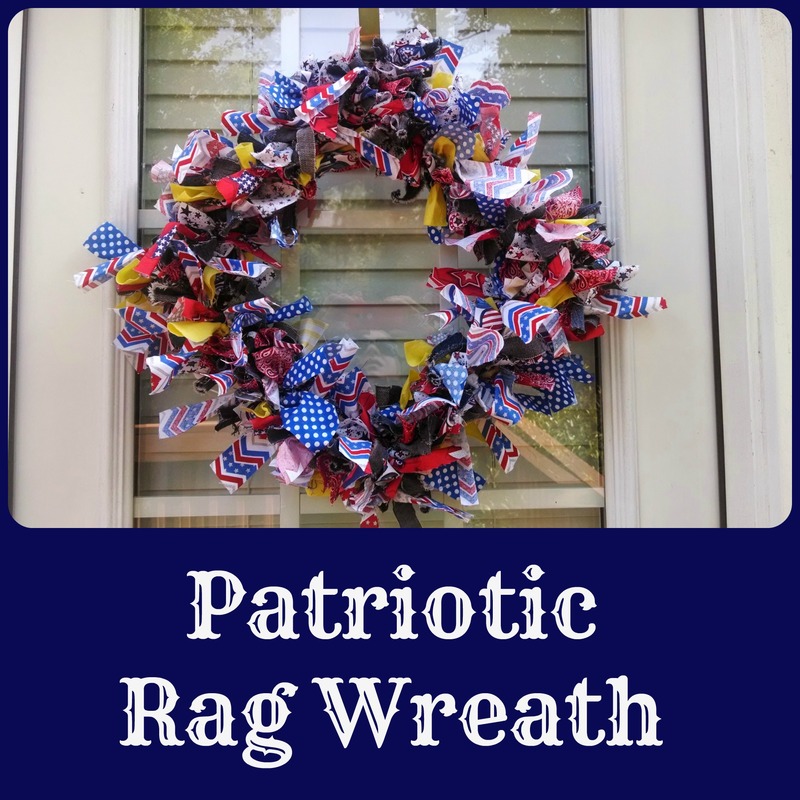 My patriotic decor is sadly lacking, so I decided to channel my inner Betsy Ross (sort of) and make a rag wreath to show a bit of patriotism. I love this wreath. I wanted to make it very ‘American’ and what’s more American than jeans? 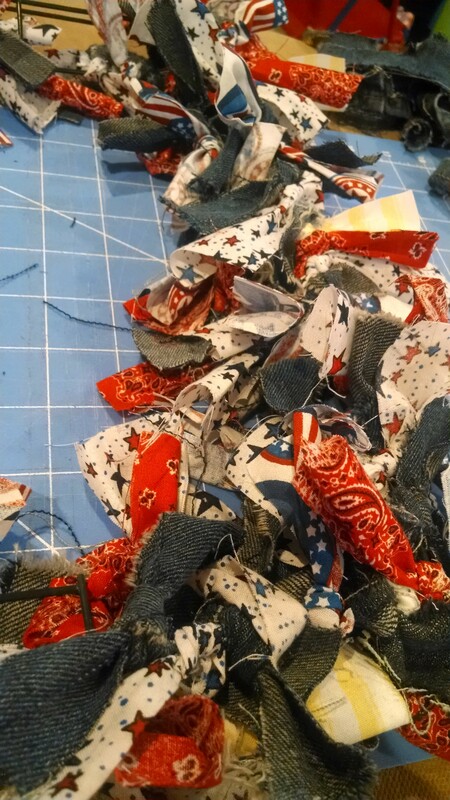 I cut the fabric into 2×6-inch(ish) strips. Some were narrower. Some were longer, some were shorter. It’s a rag wreath. It all works out. I found the denim easier to tie if it was narrower. Also, I tore some of the denim to make it more raggy. Denim with stretch in it doesn’t tear well. I used a rotary cutter for the fabric because it was easier and quicker and I know it will fray on its own. Then, I tied the strips to the wreath form. This is great to do while watching TV. The mom in me can’t sit still and has to constantly be doing something. Tie tie tie…then tie some more. I was surprised at how much fabric this took. I had originally gotten just three 1/4 yards, but ended up having to go get more and dip into my stash for a few extra strips (the blue polka dot and the yellow fabrics). So that’s the rag wreath. I love how fluffy it is. Easy peasy and fun. I might add to the center of it, but for now, I’m enjoying seeing how it’s been unraveling. And now I have something handmade for all my patriotic holidays! 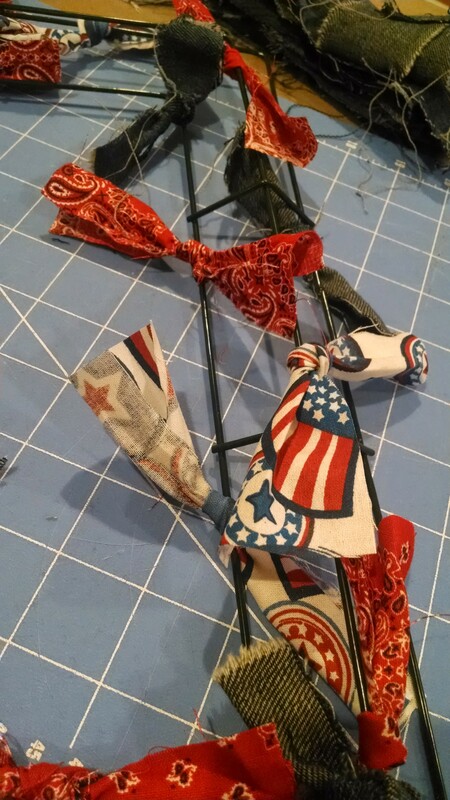 I’d love to see any patriotic crafts you’ve made! Link them below! 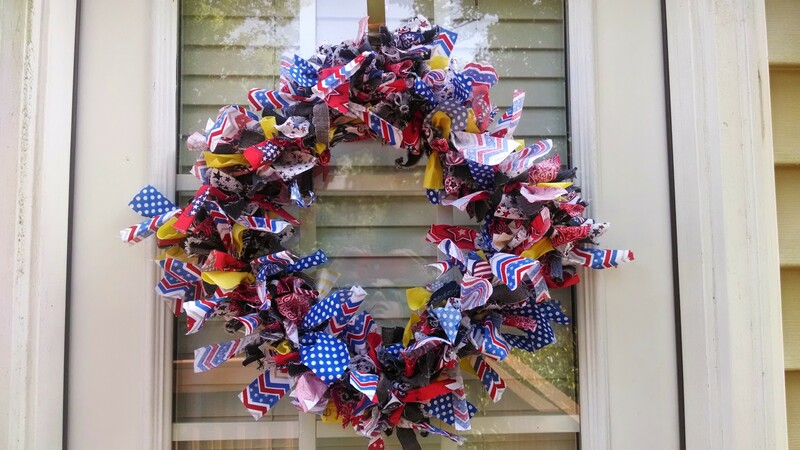 This entry was posted in celebrations, crafts, holidays and tagged fourth of july, patriotic crafts, patriotic wreath, rag wreath on July 4, 2014 by aliciamariel.